This German car is so little talked of that we have no idea how to pronounce its name. The Cito company was founded in 1896 in Cologne-Klettenberg as a manufacturer of bicycles and motorcycles. In 1905 Cito built their first car: known as the Citomobil, it used proprietary components from the Omnimobil company in Aachen, a supplier of kits of parts to companies such as bicycle manufacturers who had only basic factory equipment. These kits included such essential items as engines, gearboxes, chain or shaft transmissions, axles and steering. In 1906 Cito launched new models with 2-cylinder 6/10 HP Aster engines and 4-cylinder engines of 10/18 HP and 15/24 HP, almost certainly from Omnimobil. By the date of our Snapshot, Omnimobil had started to make their own cars under the Fafnir name, but still supplied a range of engines to other makers, and it is likely that the 4-cylinder 10/18 HP Cito in our Snapshot had a Fafnir engine. Our picture comes from the very end of the short-lived car manufacture of the Cito company. 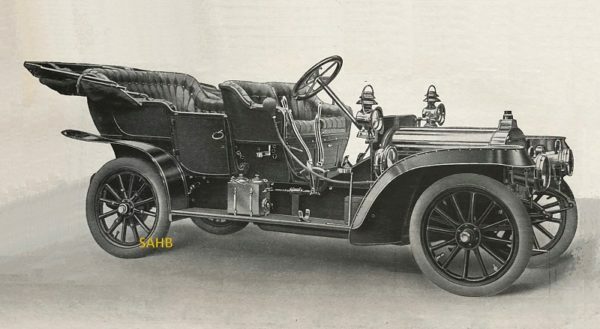 In 1908 Cito was still full of confidence, proudly stating in its advertisements for the 10/18 HP that this new model had “the lowest fuel and tyre consumption” and “express train speed”, and was an “outstanding mountain-climber”. Cito pitched its new machine as the middle way between heavy and light cars, with the comfort, speed and above all durability of the expensive car and the low maintenance costs of the light car. Sadly, these fine words did not ensure the success of the Cito car: by 1909, lack of profitability forced the company to cease car production and return to bicycles and motorcycles. We know little of the further history of Cito. It manufactured products for the German army during the war, and launched a new motorcycle model in 1919. In 1922, Cito merged with the Thuringian company Krieger-Gnädig, but galloping inflation forced closure of the company in the following year.